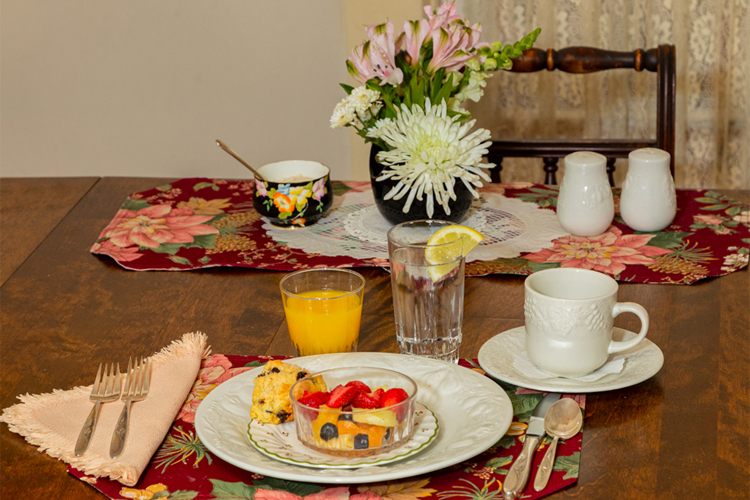 The Old Homestead Bed and Breakfast is located in the quiet village of Barnet in the Connecticut River Valley in the Northeast Kingdom of Vermont. Built around 1850, The Old Homestead has been hosting guests for 100 years. You will find Old World New England charm and warmth in this 19th Century Federalist style home — along with 21st Century amenities for your comfort. The Old Homestead Bed & Breakfast is the perfect place from which to explore all the Green Mountain State has to offer: ski, hike, cycle, swim, picnic, kayak, revel in the arts, see a film, or take a day trip around the area sampling Vermont's specialty food and cuisines, crafts and nature. Perfect in any season! Relax by the fire in a winter wonderland or revel in the spring mud season and see life bursting forth before your eyes. In the summer, enjoy the gardens or in the autumn experience the pallet of fall colors and festivals. Make Vermont YOUR vacation destination in any season! Experience gracious hospitality as you enjoy the complimentary gourmet breakfast — a three course meal of delicious home-baked breads, fresh fruits plus a hot main course such as waffles or an omelette. Dietary restrictions and preferences are no problem at this Inn. Gail will guide you to the best festivals, music, theater, art galleries, museums, farmers’ markets and restaurants of Northeast Kingdom. She can offer directions or suggestions as you explore the many ways to enjoy the natural beauty of Vermont, whether you are biking, skiing, hiking or just relaxing.